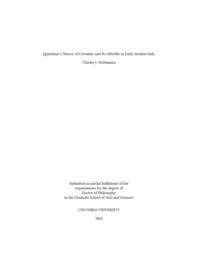 This dissertation explores how antiquity and some of its early modern admirers understand the notion of certainty, especially as it is theorized in Quintilian's Institutio Oratoria, a first-century educational manual for the aspiring orator that defines certainty in terms of consensus. As part of a larger discussion of argumentative strategies, Quintilian turns to the “nature of all arguments,” which he defines as “reasoning which lends credence to what is doubtful by means of what is certain” (ratio per ea quae certa sunt fidem dubiis adferens: quae natura est omnium argumentorum, V.10.8). These certainties, he later specifies, include not matters of scientific demonstration or objective fact, but the agreements of various communities: the laws of cities, local customs, and other forms of consensus. As the foundation of persuasive rhetoric, these consensus-based certainties situate argumentation as the practice of crafting agreements rather than demonstrating necessary conclusions. Taking as its point of departure Quintilian's novel understanding of certainty, this study looks to some of Quintilian's intellectual forebears as well as his later readers to show how his work is both a nexus of earlier intellectual developments as well as an important inspiration for later accounts of certainty, even into the early modern period. After illustrating in the first chapters of this dissertation how Quintilian's manual incorporates elements from Aristotelian notions of dialectic and rhetoric as well as from Ciceronian skeptical approaches to epistemology, I show how Quintilian's curriculum for the orator shapes the thought of Italian humanists, especially that of Lorenzo Valla (1406–1457), a reformer of scholastic logic and dialectic, and Giambattista Vico (1668–1744), an influential Neapolitan jurist. Adopting Quintilian's rendering of certainty as a matter of agreements and conventions, these later authors elaborate their own novel approaches to various fields—including law, language, and logic—through this ancient understanding of certum. Contrary to modern notions of certainty as objective or scientific fact, Quintilian's humanist readers continue to root this concept in consensus, both within the courtroom and without.